The article in this week’s That’s Maths column in the Irish Times ( TM043 ) is about the mathematical curves called clothoids, used in the design of motorways. Next time you travel on a motorway, take heed of the graceful curves and elegant dips and crests of the road. Every twist and turn, every rise and sag, has been mathematically modelled to ensure that you have a pleasant and uneventful journey. Aesthetics play a role in highway design, but the primary focus is on your safety and comfort. 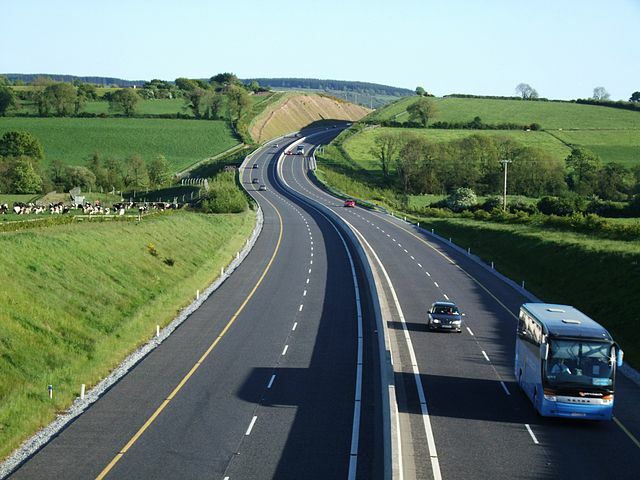 The M8 approaching Watergrasshill in Cork [image from Wikimedia Commons]. The road alignment, or horizontal plan of the route, comprises straight sections and circular arcs, linked by smooth transitions to avoid any sudden changes. On a straight stretch or tangent section, there are no lateral forces. On a circular section there is an outward force — the centrifugal force — which varies with the square of the speed and with the curvature. The curvature, or bendiness, is the inverse of the radius, and is larger for sharper bends. We are all familiar from school geometry with lines and circles, but the transitions between them are more exotic curves called clothoids (see previous post on rollercoasters). If the road were to change abruptly from a straight section to an arc, a sudden steering manoeuvre would be needed and a jerky onset of the centrifugal force would mean a very uncomfortable ride. To avoid this, a clothoid spiral section is interposed, linking the tangent to the arc. The clothoid has a beautiful mathematical property: its curvature increases linearly with distance, from zero at the tangent end to the curvature of the arc where they meet. This means that the driver can turn the steering wheel gradually as she enters the curve, and the centrifugal force builds up slowly, minimising any discomfort. We feel the centrifugal force strongly on a fun-fare ride but on motorways it must be kept small. If the design speed of the road is high, wider arcs are needed to ensure smaller curvatures. Moreover, banking or ‘camber’ is added, the road sloping downward towards the inside to give a component of gravity that offsets the outward thrust. The vertical profile of the road is also crucial for safety. It comprises steady grades — uphill, down or level — linked smoothly by parabolic sections. Here, visibility is a key concern: a sharp rise or dip can reduce driver vision drastically, especially at night, severely limiting the maximum safe speed. Engineers design roads to reduce these effects. The calculation of the alignment and profile of motorways is done using sophisticated computer programs. They generate realistic visual graphics, and the design engineer can view the road from the driver’s perspective long before construction begins. The computer calculates the clothoid splines, parabolic profiles and more complex curves to ensure that the design meets exacting smoothness and safety standards. Clothoid curves were first used to study diffraction, the bending of light around opaque objects. They are expressed in terms of mathematical quantities called Fresnel integrals, named for the French engineer Augustin-Jean Fresnel who helped to develop the theory of wave optics. But, as with many other mathematical innovations, clothoids were originally studied by Leonhard Euler, the Swiss genius who has been called “the master of us all”. Before the age of the motorway, clothoids were used to design transitions or easements on railway lines. More recently they have been employed in the construction of heart-stopping vertical loops on rollercoasters. Here the goal is not to reduce the centrifugal effect but to raise it to the highest safe level.